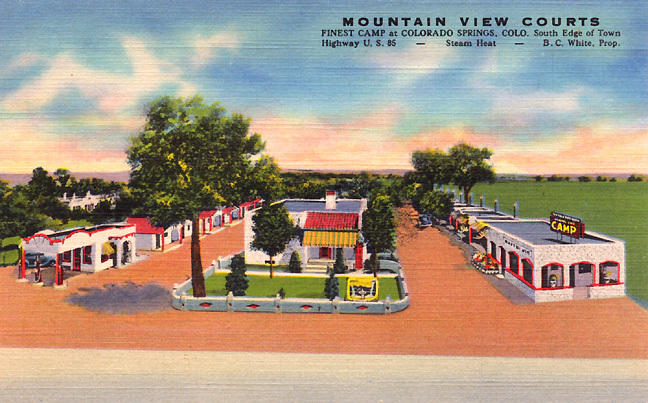 Entering Colorado from the East? 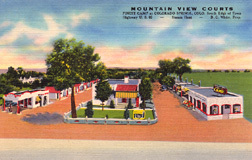 You might as well check out Pueblo and some of the most annoying vehicular pacification systems (also known as speed bumps) known to humankind. But don’t stop long or you’ll be disappointed. 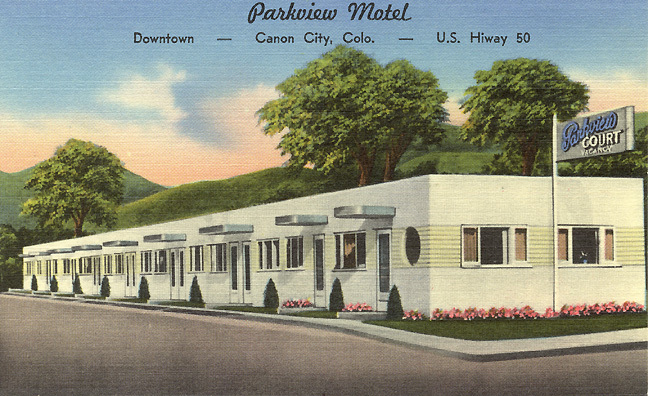 Head north on Interstate 25 (gritting your teeth through traffic, construction, and the indignity of superslab travel) and you’ll find one of the truly most awesome displays of mid-century motel design in the nation. 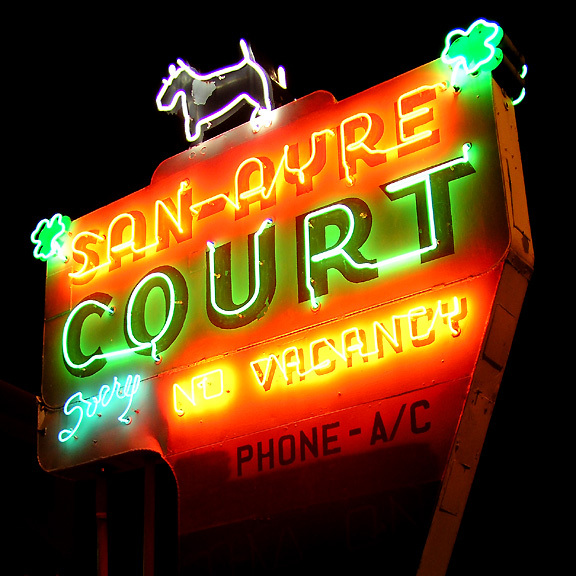 Ranking easily with Tucumcari, New Mexico, and Wildwood, New Jersey, the towns of Colorado Springs and Manitou Springs offer a stunning collection of animated signage and glowing neon. 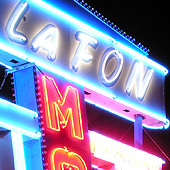 Included in this gorgeous assemblage, the La Fon with a sign that would break the ordinances of 99 percent of American cities for height and brightness. 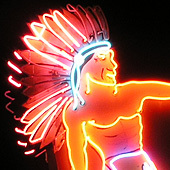 Across the street, you can grab a turkey sandwich at Moe’s Diner that rivals anything you might get at a big city diner. The conversation with local folks comes free with the meal. 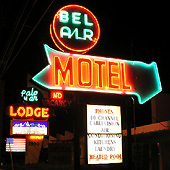 Staying the night? 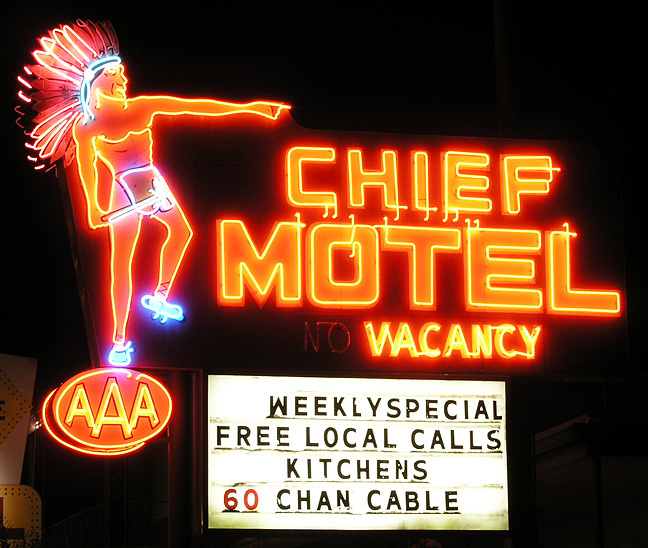 Head back to Colorado Springs and the Chief Motel for the best value – and an unforgettable combination of tackiness and charm as a neon warrior invites you – tomahawk in hand – off the road for a snooze. 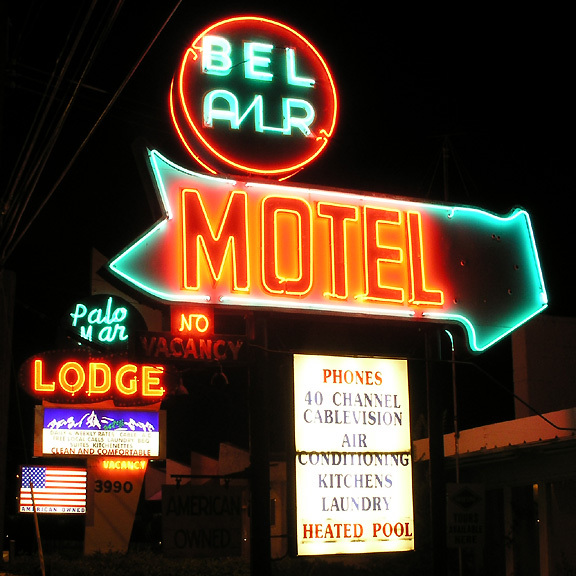 Eventually, you’ll try for Denver, confident that a city with such a vast main street (Colfax Avenue stretches 26 miles) ought to boast a fair number of motels. 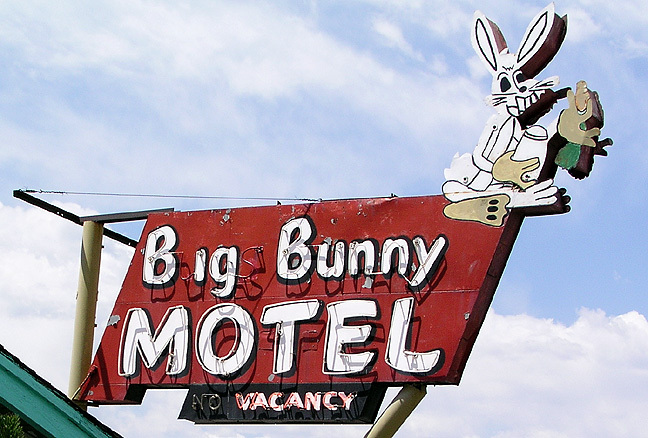 Sure enough, green cactus shaped A Bar D Motel, the Big Bunny Motel (once called “Bugs Bunny” before some nasty legal intervention), and the Rocky Mtn. 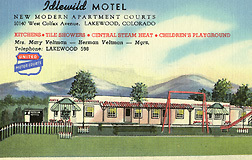 Motel with its weather-worn mountainous peaks represent a photographer’s dream. But you’ll want to keep driving through town. 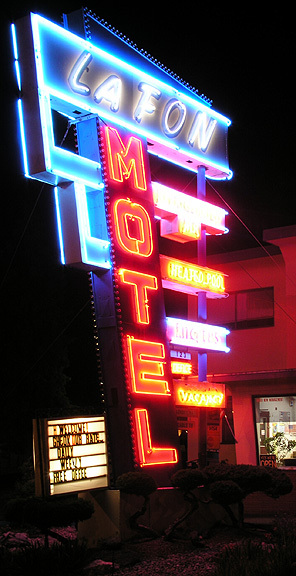 On the East end of Colfax, you’ll find the Top Star Motel, at home in an area in which virtually every sign warns against the scourges of prostitution, drug use, and unregistered guests. 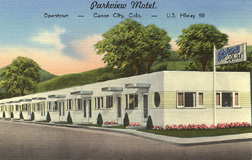 Indeed, as you contemplate your accommodations along the main Denver thoroughfare, remember this piece of advice: a motel that offers “sleeping rooms” probably doesn’t provide a continental breakfast. All text copyright Andrew Wood. Photos copyright Jenny Wood and Andy Wood. 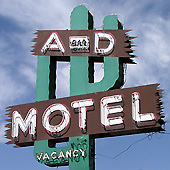 Classic Motel Americana: Check out an old page for this state. 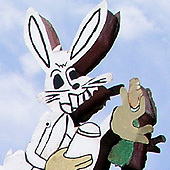 It is no longer maintained but may bring back some fun memories. Take a look!